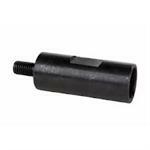 1 1/4"-7 Female x 5/8"-11 Male Core Bit Adapter. Allows use of smaller diameter diamond core bits on core rigs with standard 1 1/4"-7 spindle threads. 1 1/4"-7 Male x 5/8"-11 Female Core Bit Adapter. Allows use of lager diameter diamond core bits on core rigs with standard 5/8"-11 spindle threads. For Hilti® Machine: DD130 AND DD100. Converts DD130 AND DD100 to standard 5/8"-11 Core Bit Thread. For Hilti® Machines: DD250,DD160 and DCM1.5. Converts DD250,DD160 and DCM1.5 to standard 1 1/4"-7 Core Bit Thread. For Hilti® Machine: DD200. Converts DD200 to standard 1 1/4"-7 Core Bit Thread. For Hilti® Machine: DD130 AND DD100. Converts DD130 AND DD100 to standard 1 1/4"-7 Core Bit Thread. Allows Drills without water feed to be used with wet cutting diamond core bits. 5/8"-11 Female threads x 5/8"-11 Male threads. To convert rotary hammers to wet drilling use water swivel with rotary hammer adapters with 5/8"-11 Threads.